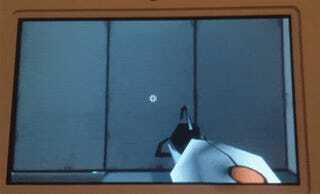 Here's Portal Running On The 3DS. Pity Valve Didn't Make It. Hey, remember Portal on the DS? Well, Portal (or at least a demo of it) is now also on the 3DS. It's not an official Valve product, of course—as if Valve would ever make another video game!—but it still does the job. The clip you're seeing here is from the demo for a homebrew project that has a few levels and shows off most of the game's famous mechanics. Considering the hardware it's running on, it looks great! The demo's creator, Smea, is the same guy who made Portal on DS. He says that while he's "not yet sure what my future plans for this are for this game", he'd also "love to make it into the full game it deserves to be by implementing more gameplay elements, improving performance and getting some higher res assets in there". In case someone else wants to work on it too, or take up where he leaves off if he has to stop working on it, he's posted the source code online.